A delightful gentleman, Lou Pirkstead, was well-liked by all. He was quiet and agreeable, thus a friend to all in our retirement living community in Atlanta. Mr. Pirkstead often sat outside on the bench with the other residents to absorb their conversation. One day, Donna, a friend and co-worker, asked me to look out my window to admire Mr. Pirkstead's lovely earrings. Shocked, I looked and was entranced with his lovely pink, rose clip earrings! Yep! 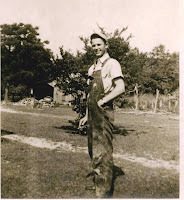 There he sat on the park bench in his farmer's overalls, plaid shirt, baseball cap and pink rose clip on earrings! The next day, Mr. Pirkstead found himself with his friends on the bench again...wearing the pink rose clip earrings! Donna bravely ventured outside and asked Mr. Pirkstead why he was wearing the earrings. He told her that they had been a gift and he felt he should wear them. Oh, bless. There is a tremendous lesson to be learned about gift-giving, isn't there? What a gentle soul.